Everyone's favorite time of the month has rolled around once again, coinciding with a morning announcement from Bushiroad South East Asia unveiling the English-language logos for G-EB01: Cosmic Roar and G-TD04: Blue Cavalry of the Divine Marine Spirits. Cosmic Roar was announced last December, and will be released in Japanese on March 13th and in English on April 17th. The set consists entirely of cards for the Dimension Police clan, with support for the Dimensional Robo, Enigman, Zeal and Metalborg subclans. Anticipating problems with game balance following the set's release, Bushiroad has preemptively restricted Commander Laurel in Japan to just one copy in order to mitigate his use with the new stride units. This month's issue of Monthly Bushiroad magazine revealed several cards from Cosmic Roar alongside cards from G-BT02: Soaring Ascent, introducing the first new Enigman and Zeal support cards since BT08: Blue Storm Armada and BT13: Catastrophic Outbreak. 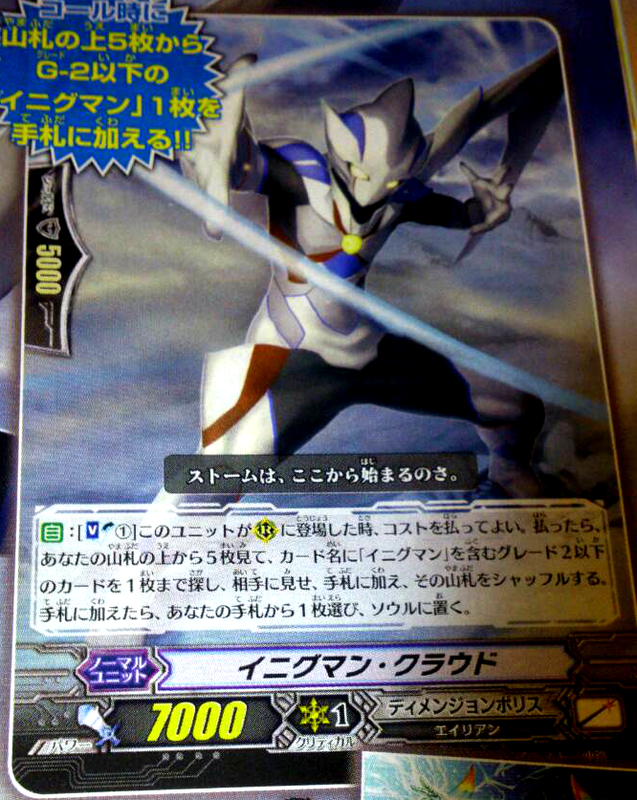 The first card revealed is the grade 1 Enigman Cloud, an homage to 2011's Enigman Ripple. AUTO: [Soulblast 1] When this unit is placed on a rearguard circle, you may pay the cost. If you do, look at up to 5 cards from the top of your deck, search for up to one grade 2 or less card with "Enigman" in its card name, reveal it to your opponent, put it into your hand and shuffle your deck. If put into your hand, choose a card from your hand, and put it into your soul. When successful Cloud's skill effectively trades a card in hand for an Enigman from the deck, and opens up the potential for correcting the rides of Enigman decks that use the Storm evolution line. Cloud can search for himself, which can lead to rapidly changing out less useful cards like draw triggers to quickly fill the field. Next is Evolving Beast Darvain, who similarly manipulates the soul but does so by trading cards from the field rather than from the hand. AUTO: [Choose one of your other rearguards, and put it into your soul.] When this unit is placed on a rearguard circle, you may pay the cost. If you do, search your deck for up to one card with "Zeal" in its card name with the same grade as your vanguard, ride it as stand, and shuffle that deck. If you rode, choose a card from your soul with the same grade as your vanguard, call it to a rearguard circle and choose one of your opponent's vanguards, during this turn it gets Power -3000. 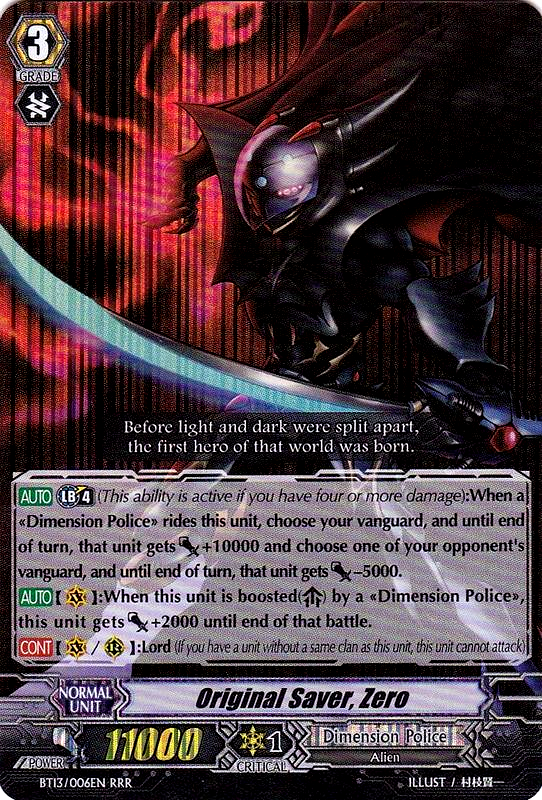 In the early game Darvain can be used to trade copies of draw triggers or spent on-call rearguards for lower graded Zeal units, aggressively decreasing the opponent's power even prior to reaching grade 3 while also ensuring that you ride the key units Eye of Destruction and Devourer of Planets Zeal. If you open with multiple copies of Darvain it's also possible to put your first copy into the soul for the cost of the second and then pull it out again, triggering a loop limited only by the number of Eye of Destruction Zeals in your deck. The second Darvain when called out will put the first one into the soul and call it back out, which in turn puts the second one in and out again. While only truly useful when going second or while gradelocked, this can put the opponent down to -12000 power if you don't open with Eye of Destruction. Later on Darvain can help replenish the field using cards from the soul while stacking negative power bonuses on top of Zeal's. Galactic Beast cardfighters have always favored stand triggers and aggressive turns to capitalize on the decreased power, which Darvain caters to. The Evolution Beast's skill can also be used to superior ride Zeal over a break ride, allowing you to use Original Saver Zero to give the opponent a net -8000 power from both Zero and Darvain's skills. This exchange causes you to break even on your own card advantage, as Darvain's soul-in and superior call are a net +0, providing multiple incentives to ride through Darvain rather than through the hand. If you have the limit break enabler Dailion in play, then you can execute this play the moment you ride Zero on your third turn. With Galactic Beast Zeal's limit break, these can together stack up to -13000 power, leveling even crossrides to 0 power. The last Dimension Police unit revealed in the issue is the grade 2 Metalborg, Magma Fork. Fork is a custom attack that specifically takes advantage of legion mechanics, as is characteristic of the Metalborg subclan as a whole. 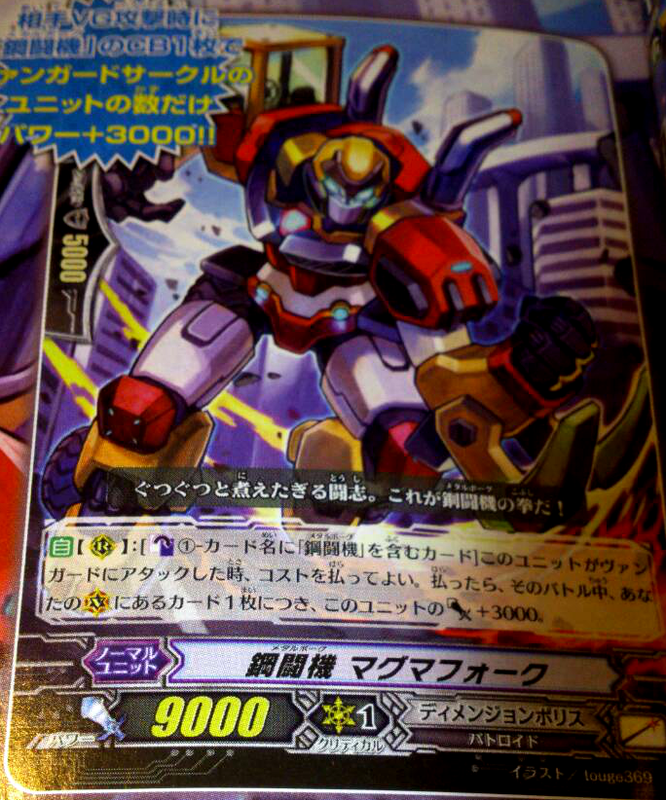 AUTO: [Counterblast 1 "Metalborg"] When this unit attacks a vanguard, you may pay the cost. If you do, during that battle, for each card on your vanguard circle this unit gets Power +3000. While in any other deck Fork's counterblast would seem wasted compared to a standard subclan attacker, with an in-legion Metalborg vanguard Fork can gain two instances of the power bonus, becoming a 22000-power attacker that can help overwhelm the opponent after the vanguard has drained their hand. 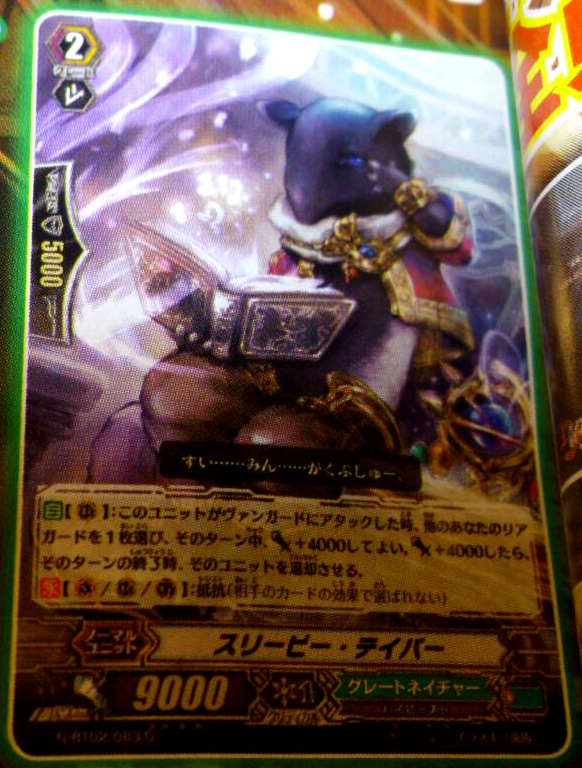 Other key units revealed in the magazine issue include Sleepy Tapir and a new legion for Gear Chronicle. Tapir is a clone of Binoculus Tiger empowered with Resist, who can give +4000 power to a different rearguard when he attacks but then has to retire it during the end phase of the turn. 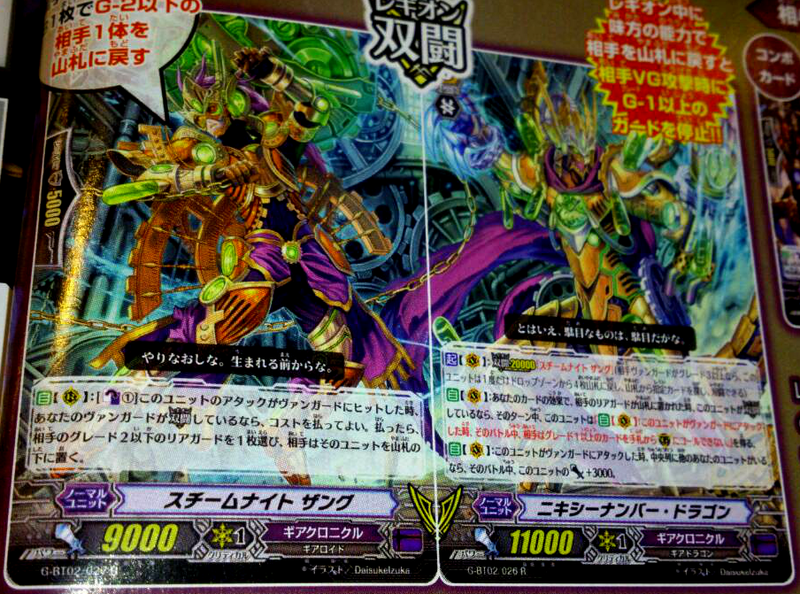 The new Gear Chronicle legion is Nixie Number Dragon and his legion mate, Steam Knight Zangu. 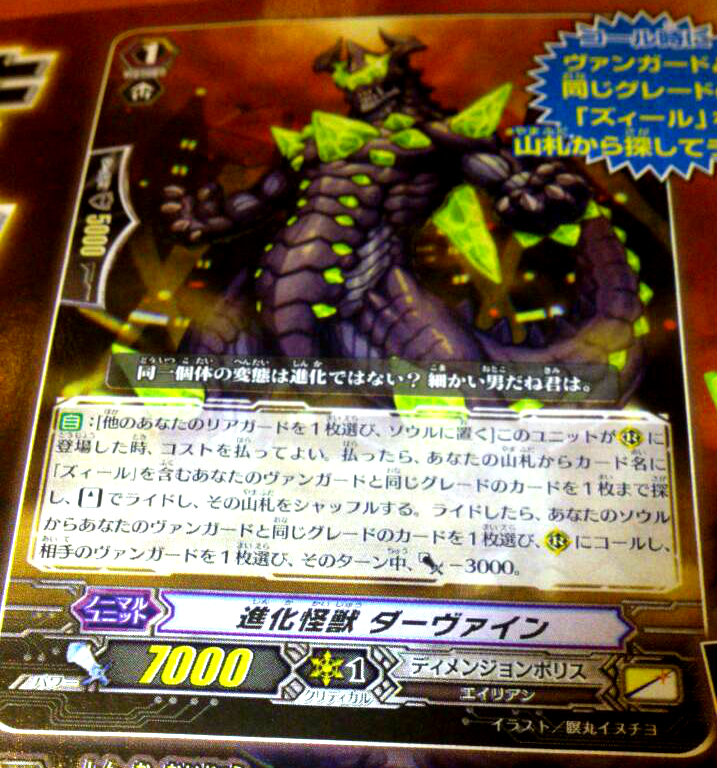 Zangu's counterblast 1 lets him send an opponent's grade 1 or lesser rearguard to the bottom of their deck when the vanguard is in legion and his attack hits, making him a conditional replacement for the Relic Master Dragon introduced in the previous issue. Nixie Number's legion skill follows up on Chronojet's from the trial deck; when one of his fighter's card skills places an opponent's rearguard on the bottom of their deck, Nixie Number gets a skill that prevents the opponent from calling grade 1 and greater cards to the guardian circle, blocking perfect defense cards. Perhaps the most shocking reveal about these cards is that Nixie Number and Zangu are normal rares in the set, not double or triple rares. This gives very easy access to a guard manipulation unit for newer Gear Chronicle cardfighters, and one that independently attacks for 23000 power. Legion 20000 "Steam Knight Zangu"
AUTO (Vanguard circle): When your card effect places your opponent's rearguard into their deck, if this unit is in legion, during this turn, this unit gains "AUTO (Vanguard circle): When this unit attacks a vanguard, during this battle, your opponent cannot call Grade 1 or higher cards from their hand to their guardian circle". AUTO (Vanguard circle): When this unit attacks a vanguard, if there is another unit in your center column, this unit gets Power +3000 during this battle.